The elevation of Ak-Chin Regional Airport is 1,300 feet Mean Sea Level (MSL). 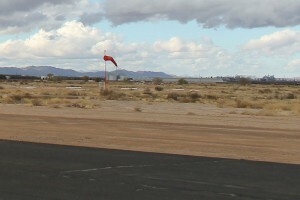 The terrain surrounding the airport is generally flat with the exception of a few foothills to the east and higher terrain on its borders to the northwest and northeast. The Sierra Estrella Mountains are approximately 15 nautical miles northwest of the airport and reach as high as 4,512 feet MSL at Hayes Peak. The San Tan Mountains are located approximately 14 nautical miles northeast of the airport and reach as high as 3,104 feet MSL. Ak-Chin Regional Airport currently has a single-runway configuration. Runway 4/22 is constructed of asphalt and is 4,751 feet long and 50 feet wide with a pavement strength of 12,500 pounds Single Wheel Gear (SWG). The pavement is in good condition and was recently crack sealed, fog sealed, and remarked. Runway 4/22 has non-precision markings that are in good condition. 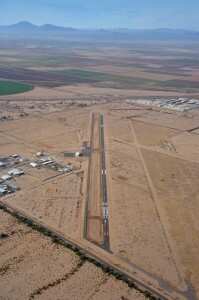 Runway 22 has a displaced threshold of 571 feet which reduces the landing distance on Runway 22 to 4,464 feet. The aircraft parking apron at Ak-Chin Regional Airport has approximately 54,280 square feet of area, with a pavement strength of 12,500 pounds (SWG), containing 12 tiedowns. Ak-Chin Regional Airport is located within the jurisdiction of the Albuquerque Air Route Control Center (ARTCC) and the Prescott Flight Service Station (FSS). The altitude of radar coverage by the Albuquerque ARTCC may vary as a result of the FAA navigational/radar facilities in operation, weather conditions and surrounding terrain. 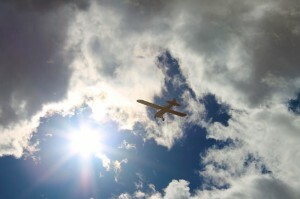 The Prescott FSS provides additional weather data and other pertinent information to pilots on the ground and enroute. Ak-Chin Regional Airport is situated within class G airspace from the ground to 1,200 feet AGL and Class E airspace between 1,200 feet AGL and 18,000 feet MSL. It is within 32 to 55 miles of various Military Operation Areas (MOA) and Military Training Routes (MTR), which may restrict airspace by NOTAM. The traffic patterns at Ak-Chin Regional Airport are standard left traffic for Runway 4 and Runway 22. Traffic Pattern Altitude (TPA) is 2,300 MSL for all aircraft. There are currently no noise abatement procedures in place at the airport. However, the airport is within 15-30 miles of Special Conservation Areas where pilots are requested to avoid flight below 2,000 feet AGL. There are no existing published instrument approach procedures, no air traffic control tower (ATCT) and no NAVAIDs located at Ak-Chin Regional Airport. The nearest NAVAIDs is the Stanfield VORTAC, which is located approximately 7 nautical miles south of airport. Airfield lighting at Ak-Chin Regional Airport consists of a rotating beacon, lighted wind cone, and segmented circle. The holding position bars on the connector taxiways are located 125′ from runway centerline.